Notes for Wave Motion chapter of class 11 physics. Dronstudy provides free comprehensive chapterwise class 11 physics notes with proper images & diagram. A wave is a disturbance that travels or propagates and transports energy and momentum without the transport of matter. The ripples on a pond, the sound we hear, visible light, radio and TV signals are a few examples of waves. Sound, light and radio waves provide us with an effective means of transmitting and receiving energy and information. Waves are of two types : mechanical and electromagnetic. Mechanical waves require material medium for their propagation. Elasticity and density of the medium play an important role in propagation of mechanical waves. That is why the mechanical waves sometimes are referred to as elastic waves. Electromagnetic waves require absolutely no material medium for their propagation. They can travel through vacuum. Light, TV signals, radio waves, X-rays, etc. are examples of non mechanical waves. These are electromagnetic in nature. In an electromagnetic wave, energy travels in the form of electric and magnetic fields. There are three ways of classifying mechanical waves. Waves differ from one another in the manner the particles of medium oscillate (or vibrate) with reference to the direction of propagation. (i) Transverse Waves : In such waves, the oscillatory motion of the particles of the medium is transverse to the direction of propagation. Consider the wave travelling along a rope. The direction of propagation of the wave is along the rope, but the individual particles of the rope vibrate up and down. The electromagnetic wave (light, radio waves, X-rays, etc.) through not mechanical, are said to be transverse, as the electric and magnetic field vibrate in direction perpendicular to the direction of propagation. (ii) Longitudinal Waves : In these waves, the direction of vibration of the particles of the medium is parallel to the direction of propagation. 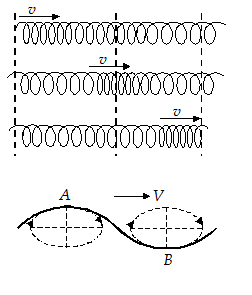 The figure shows a long and elastic spring. When we repeatedly push and pull on end of the spring, the compression and rarefaction of the spring travel along the spring. A particle on the spring moves back and forth, parallel and anti-parallel to the direction of the wave velocity. Sound waves in air are also longitudinal. Some waves (for example,ripples on the surface of a pond) are neither transverse nor longitudinal but a combination of the two. The particles of the medium vibrate up and down, and back and forth simultaneously describing ellipses in a vertical plane. In strings, mechanical waves are always transverse, when the string is under a tension. In gases and liquids, mechanical waves are always longitudinal, e.g., sound waves in air or water. This is because fluids cannot sustain shear. They do not posses rigidity. They posses volume elasticity, because of which the variations of pressure (i.e., compression and rarefaction) can travel through them. For this reason, the longitudinal waves are also called pressure waves. The waves on the surface of water are of two kinds: Capillary waves and gravity waves. Capillary waves are ripples of fairly short wavelength - no more than a few centimeters. The restoring force that produces these waves is the surface tension of water. Gravity waves have wavelength of several meter and restoring force is the pull of gravity. In solids, mechanical waves (may be sound) can be either transverse or longitudinal depending on the mode of excitation. The speeds of the two waves in the same solid are different (longitudinal waves travel faster than transverse waves). One-dimensional wave travels along a straight line, e.g., waves produced on a string. Two-dimensional wave propagates over a surface, e.g, water ripples, vibration of the surface of a drum. Three-dimensional wave propagates in all directions, e.g., sound waves. These can be two types of waves – wave pulse and wave train. (i) Wave pulse: In this case, the motion of a particle of the medium has following time sequence. First the particle is in equilibrium (no motion) state. It then gets some type of motion or disturbance, and finally it returns to it equilibrium position. We can generate a transverse wave pulse on a string by once displacing one end of the string up and down. As the displacement pulse travels along the string each particle in the string begins at rest, experiences a displacement as the pulse passes through it, and then returns to the equilibrium. (ii) Wave Train : In a wave train all the particles of the medium undergo a continuous periodic motion. Any continuous succession of pulses constitution a wave train. Specially, if the periodic motion of the particles is simple harmonic motion, the wave is called sinusoidal wave train. The disturbance created by a wave is represented by wave function. For a string, the wave function is a (Vector) displacement; whereas for sound waves, it is (scalar) pressure or density fluctuation. In the case of light or radio waves, the wave function is either an electric or magnetic field vector. Consider a disturbance or a pulse travelling along x-direction with a velocity v. Let us look at this pulse from two different frames of reference. The xy-frame is stationary, whereas the other frame x'y' is moving with velocity v along x-axis, as shown in the figure. We assume that the origins of the two frames concede at t = 0. In the stationary frame, the pulse has the same shape but it is moving with a velocity v. It means that the displacement y is a function of both x and t.
This equation represents a wave motion along +ve x-direction. is called the phase of the wave function. Any function of space and time which satisfies above differential equation is a wave. or satisfy the wave equation, and hence these are wave functions. Note that for a function to be wave function, the three quantities x, t and v must appear in the combinations or . Thus, is acceptable but is not. 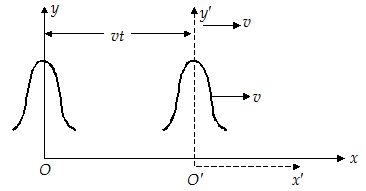 Negative sign between t and x implies that the wave is travelling along positive x-axis and vice-versa. The wave function of a pulse is given by , where y is in metres and t is seconds. 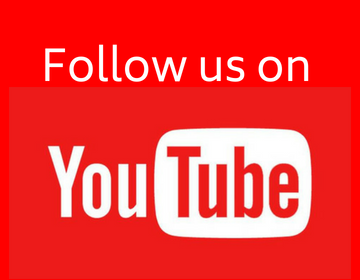 Determine the wave velocity of the pulse and indicate the direction of propagation of the wave. Since these occurs negative sign between x and t in the given expression, the wave propagates along the +ve x-axis. If the source of the wave is a simple harmonic oscillator, the function is sinusoidal and it represents a harmonic wave train or simply, a plane progressive wave. When such a wave passes through a given region, the particles of the medium execute simple harmonic motion. Clearly a set of four parameters A, and k completely describes a plane progressive wave. It represents the maximum value of the wave function from its equilibrium value. The phase constant or initial phase enables us to find the position from where time is considered. If all t = 0, x = 0 and y is also zero, then will be zero which is usually the case with a wave. Henceforth, we shall assume = 0 and the wave is travelling along positive x-axis unless stated otherwise. The SI unit of f is Hz (hertz). It is same as the number of complete vibrations of a point that occur in one second. w is measured in rad/s. Note that w, f or T are the characteristics of the source producing the wave and are independent of the nature of the medium in which the wave propagates. where is the wavelength. The wavelength ( ) is the distance between two consecutive points vibrating with the same phase (for example, two creasts). The constant k or wavelength depends on the nature of the medium. Calculate the velocity of sound in a gas, in which the difference in frequencies of two waves of wavelength 1.0 m and 1.01 m is 4 Hz. The phase changes both with distance x and time t.
The change in x is also called path difference. If = l, we get . That is, a path difference corresponds to a phase difference of rad. A progressive wave of frequency 500 Hz is travelling with a velocity of 360 m/s. How far apart are two points 60° out of phase ? We know that for a wave .